See us in Booth 413, April 28 – May 2 in St Louis at the IEEE-IAS / PCA Cement Conference. JADCO Manufacturing delivers longer life for your wear resistant steel equipment. If your components are not lasting as long as you expect, JADCO is ready to assist your efforts. Understand – if your crew is pleased with how fast they can change out certain wear components; you know those items are failing to deliver the life you expected. Here is a short list of common replacement components we deliver to the cement industry. Are You Ruining Your Wear Plate? Your good intentions can transform quality wear plate into low cost mild steel, without understanding you made a mistake. There are times when trying to save a little money results in destroying thousands of dollars of equipment, and lost production time you can never recover. Through hardened wear resistant steel has strict temperature limits that must not be exceeded. 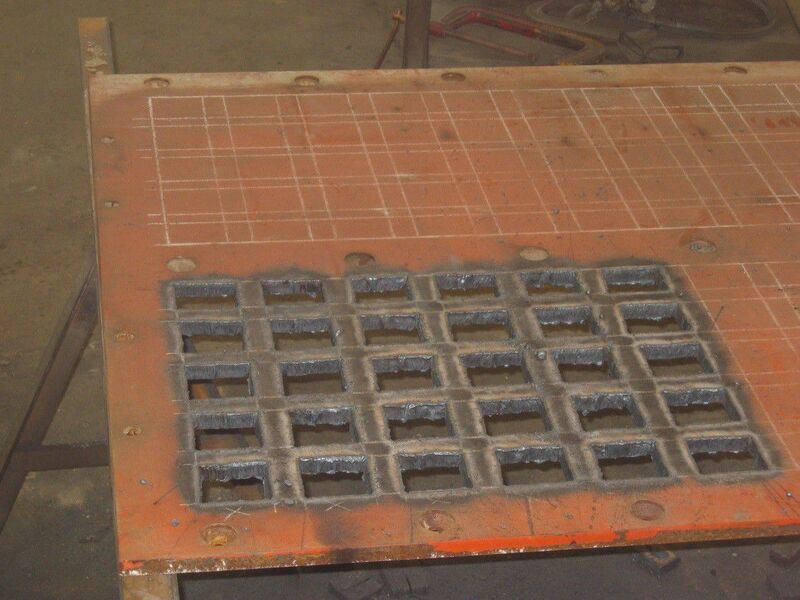 When you heat AR400 or AR500 type wear plates over 400°F, it quickly loses the hardness you had invested. Using a torch to hand cut these holes, shown above, has ruined this plate. I try to gain some form of growth every day. It's either from gaining knowledge and wisdom through personal experiences; or from my experiences working to solve other people's challenges. Unfortunately, too many salespeople operate in the ‘Fake it til you Make it’; school of pretending to know what they are doing. Customers can quickly detect this non-authentic vibe and realize these people would rather make up credentials to appear successful, than attempt to actually strive for the experience. This is a huge disservice to every prospect they come across. Which Carbide Plate Do I Use? Deciding which chrome carbide overlay plate to use in your most challenging wear applications can be confusing and even stressful. You need to make the right selection to control your wear where it will contain some combination of abrasion and impact. This brief video explains how to select one type of carbide plate, compared to another. As one of the largest producers of CCO, or Chrome Carbide Overlay Plate in North America; JADCO president Sam Anderson answers your questions so you can confidently select the correct wear resistant steel plate to deliver maximum results in your investment. Biomass recycling is proven critical to prevent waste and preserve the environment. JADCO Manufacturing Inc. is your partner for economical, proven solutions to your abrasion, impact and corrosion wear problems. You get more for your money, when your wear plate lasts longer. Remember the saying, “You can make excuses, or you can make money; but you can’t make both.” The real question then is, are you “Playing Not to lose” rather than “Playing to Win”? People who only focus on the obstacles in front of them, never see the abundant opportunities in plain sight. This is how JADCO representatives have made our reputation, by recognizing those opportunities where others only saw problems. This is why having a specialist review your biggest challenges with you can uncover an opportunity you had not previously considered. See JADCO Manufacturing Inc., in booth number 2015. Turn right when you enter the Expo Hall. We are located in the 4th row from the right, 7th booth on your right. We recognize mining engineers want to see all the data. You need to compare everything. The benefits in each type of steel, far beyond the size, length, thickness, etc. When you get insecure about a decision, you know to go back and review all the features and benefits. Test data doesn’t lie; unlike the many of the self-serving people you have to deal with on a daily basis. Most people buying AR400 or AR500 wear plate know how big of a piece they need. Looking at the most basic comparison, they wonder consider the price per pound. Some are more expensive, others are less. To determine the actual value of the plate, you need to divide the cost of the material by the expected usable lifetime. The labor to remove and reinstall the steel will be the same regardless of the manufacturer of the steel. As an example, an industrial customer was wearing out their ore chute every month. It was made from one of the popular AR400 steel wear plates. It seems the only time we grow, is overcoming the wear plate challenges we face. To defeat these trials, we must push outside of our own comfort zone. A former mentor once said, “If you aren’t continuing to learn, you might as well quit or die; because you are just taking up space.” While painful to hear at times, it is close to the truth. Or they replaced someone who had retired or changed companies, the first choice is to reorder what was used previously, unaware it failed in this application. Everyone has more responsibilities today. The unfortunate truth is everyone has more responsibilities in their work lives today. Simply finding time to learn something new for personal growth becomes harder every year. Are You Tracking Wear Plate Life in Your Applications? Recently I spoke with a prospective customer who had many questions about testing different wear plates. I asked him, “Do you track performance of what you install?” He replied that he buys the left over scrap pieces of anything resembling wear plate. Drops are what is left after all the larger specific shapes and pieces have been cut out of a large plate. His assortment of mismatched steel pieces could be any one of a number of different steels from T-1, AR400, Manganese to re-bar or AR200.